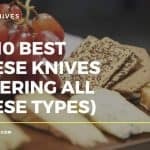 As a follow up to our recent top 5 dive knives for 2016 (which you can view here), we thought we would offer some advice on maintaining one of these knives. After purchasing a good dive knife you will want to keep it as in tip-top condition as possible. However, it is easy to allow essential maintenance to slide. 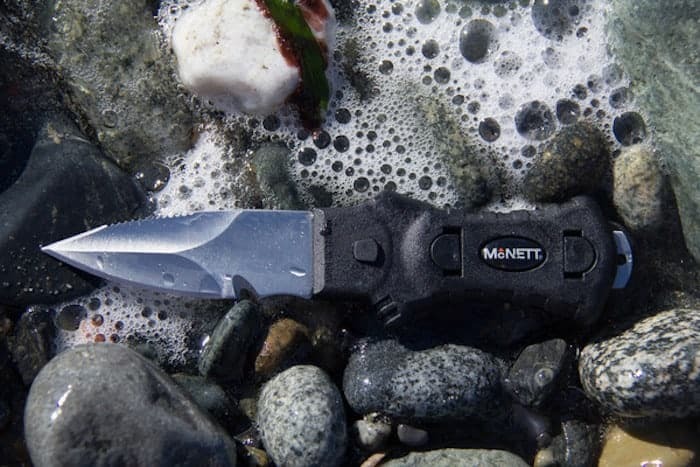 Furthermore, for those that have invested in buying a stainless steel dive knife, it doesn’t take long for a little bit of salt water to start doing damage. 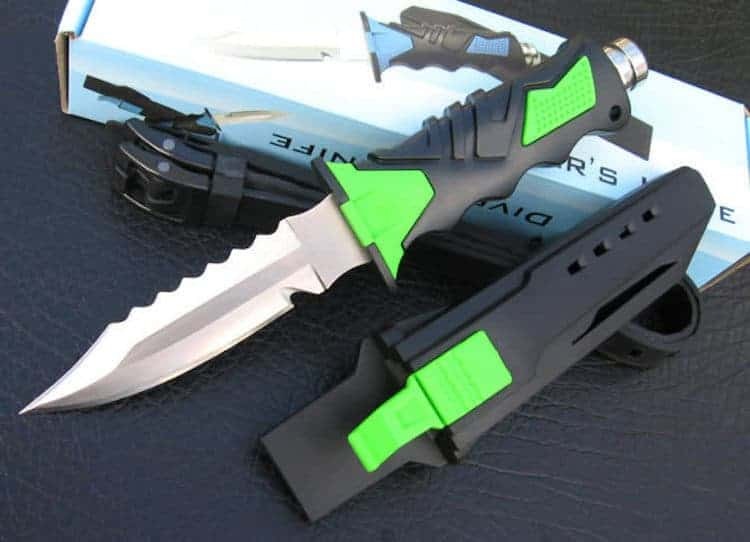 So how should you look after your dive knife? In this article we will give you simple steps that you can follow to help keep your diving tool as good as new. After every the dive, rinse the knife and the scabbard in fresh water. Wash the scabbard thoroughly to ensure no salty residue is left inside to. Once you place the knife back in, if salt remains inside slow corrosion can occur. At the end of the day’s diving, coat the surface of the knife with a water-impenetrable protective substance such as wax or a silicone grease (the same as what you apply to the o-rings). If you feel confident disassembling your dive knife, every once in a while it is good practice to remove the handle in order to give it a really thorough clean. You may wish to use a toothbrush to give it a good scrub to ensure no salt, grit or sand has found its way into the inner parts of the knife. With the knife in sections, you can also coat everything with silicon or petroleum jelly. To give a nice finishing shine to the knife you can also opt to polish the blade with a 3M pad. Finally, never go out with a dull knife. A dull blade is dangerous in that extra effort needs to be applied just to carry out simple tasks. This added force is how accidents happen as you are more likely to slip. We will now explain how you should sharpen your dive knife the right way. 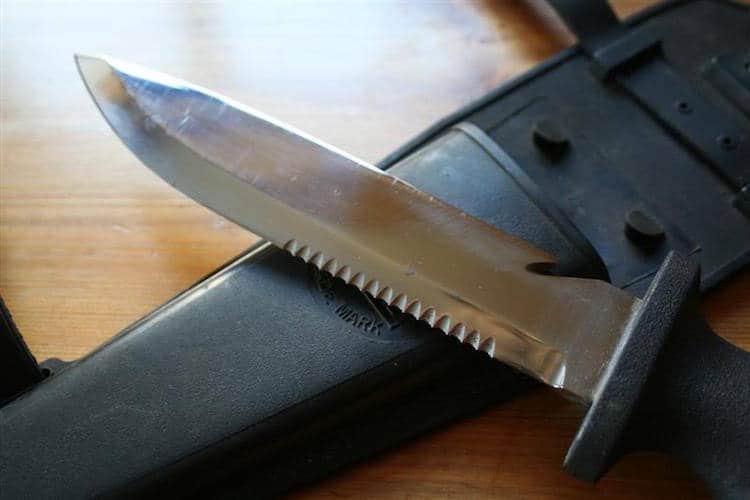 Sharpening a dive knife can be tricky if you don’t know what you are doing. As most will have a part serrated edge to the blade, you can’t just run the knife through an electric knife sharpener. While you could try to use a sharpener stone, one of the best methods is actually a ceramic rod sharpener with built in guides. 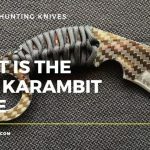 Not only are these able to get into the serrated grooves, they will also be in a vertical position at the correct angle so that all you need to do is run your knife blade along the rod, whilst holding it straight. The best ceramic rod sharpening system in our opinion is the Spyderco Tri-Angle Sharpmaker Knife Sharpener. It really is such a simple system to use (and even comes with a DVD instructional video too). 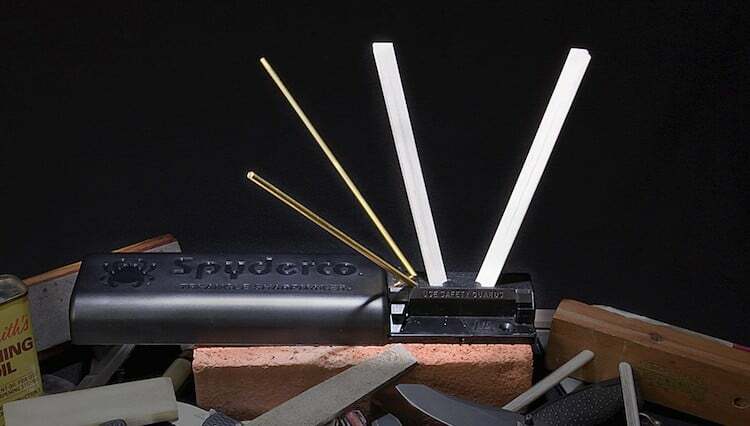 Ideal for serrated and straight edge knives, and tricky blade elements such as awls, darts and hooks, the Spyderco is a very versatile sharpening system. The rods are held at a 30 or 40 degree angle, and as we stated above, you just hold the knife vertical and pull it down the rods. There’s no need for any messy sharpening lubricant and no tricky setup. An excellent system for sharpening all manner of tools. 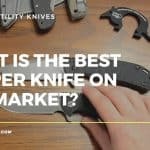 If you own or are thinking about buying a titanium dive knife, (head here for our dive knife review roundup) there are a couple of issues that you need to consider before you begin sharpening. 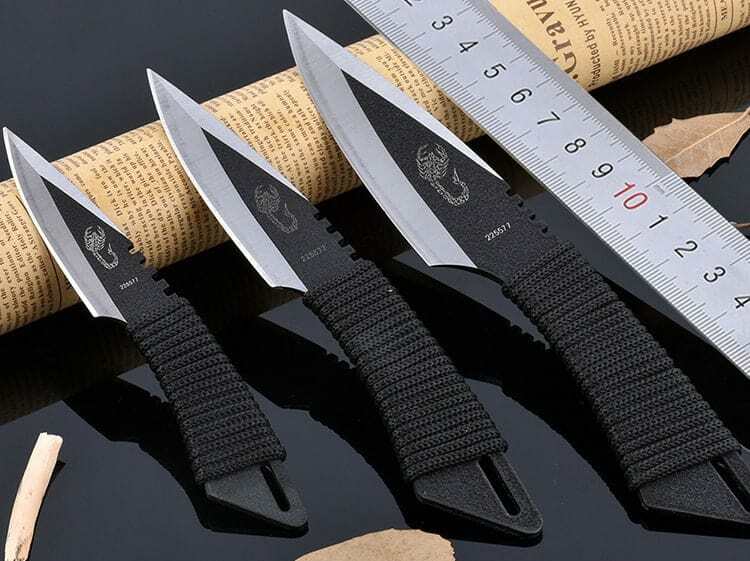 First, the sharpening frequency for titanium diving knives varies depending on the construction. For instance, beta titanium alloys are considered military grade. This is a harder material that will have greater edge retention than lower grade titanium knives. There is also the fact that some “titanium dive knives” are not made of titanium steel. They are actually only coated in titanium. This thin layer is added to increase resistance to corrosion. While the Spyderco is still a great tool to use on titanium knives, it is important that you ascertain whether you own a solid titanium knife, or a coated titanium knife before you sharpen. 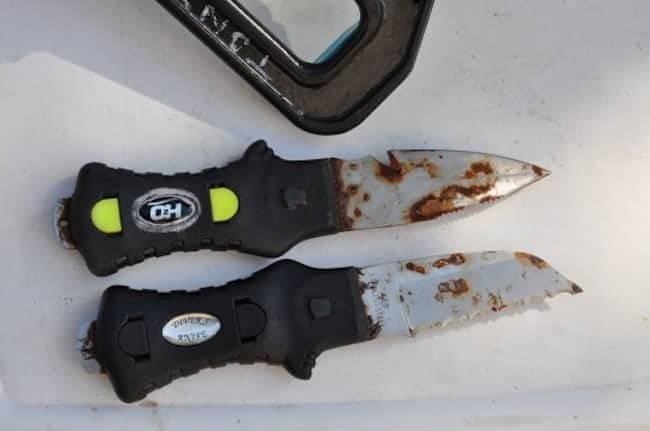 The reason being, if you sharpen a coated blade too aggressively you will loose the protective layer and increase the chance of your knife succumbing to rust. As we stated at the start of the article, it is not always easy to prevent rust from setting in on your diving tools. 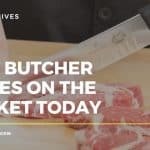 If some salt gets in your gear and then you go a while without checking your knife, the next time you pull it out, the dreaded rust may well have set in – especially on a stainless steel blade. If you discover that your dive knife has acquired rust spots, the first step you should take is to clean the blade thoroughly. DO NOT USE WATER. One method is to use a cleaning solution and wipe the blade with a clean cloth. Another method involves placing your knife into a shallow bath of white vinegar. Remove the knife and spoon baking powder onto the areas with rust. Let the knife sit for a while so the powder can work its magic. The step above is to ensure the knife is clean of loose grit and unwanted particles. Now its time to attack the rust. First soak a rag in oil and cover the knife with it for a few hours to let the solution get into the rust. (WD-40, kerosene, Vaseline, or Autosol will all do the trick here). Once you are satisfied that the knife has been soaked in the rag for long enough (3 to 5 hours is adequate), remove the blade and scrub off what should be loosened rust. Most rust removers will come with an abrasive cloth that you can use, (which importantly will not cause any undue scratch damage to your knife). Soft steel wool will also work. Using a clean cloth, wipe any excess dirt and oil away from the knife. Stand back and admire your work – your knife should sparkle and be ready for rust free use. (If for any reason some rust remains, repeat steps 1 through 4 above).